This is a very sweet and light read, there is no real drama or any over the top conflict that will make the story over convoluted. Sara Monroe has fled to the land Down Under, Australia after a disastrous ending to her relationship with a douchebag/jackass celebrity (I'd use a lot more words to describe him and so will you after you read the book). To get away she goes to stay with her cousin Ellie (we'll get her story in the next book) in Summer Beach. 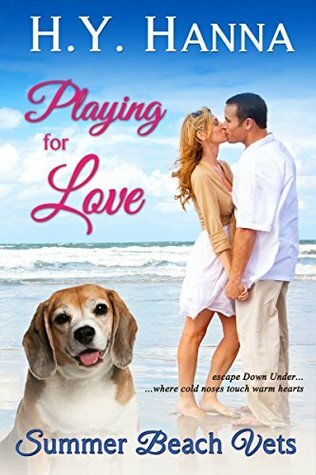 On a nice, relaxing walk on the beach, Sara finds a beagle (I think those are the Snoopy dogs) in trouble and what does this dog lover do. Why, rush it to the vets of course. Dr. Craig Murray is one of the senior partners at his practice as a vet and when the pretty American comes in with the injured doggy he is instantly smitten. The characters are nice and endearing, I like that they seem very down to earth and relatable. Obviously there will be a little conflict, because what book doesn't have a little hitch, but it works and the story still stays nice and light. If you're looking for a nice book to pass the time or if you're an animal love this is your book.